Not known in history like many of his more famous counterparts, Enrique “Henry” Garfias, the first marshal of Phoenix, Arizona should be better recognized, as many of his feats of bravery far surpass many of the more famous lawmen of the Old West. Hailing from what is now Anaheim, California; Enrique was born in 1851, the son of a Mexican Army General. At the age of 20 he headed to Arizona, first settling in Wickenburg. Three years later, in 1874, he moved once again the fledgling town of Phoenix. At that time, Phoenix had about 1,600 residents, downtown lots were selling for $7 to $11 each, and that same year, the city would get its first telegraph line. But the foolish man evidently wasn’t aware of Henry’s six-gun skills and started to draw. However, before his gun even left his holster, Garfias had drawn and shot him dead. 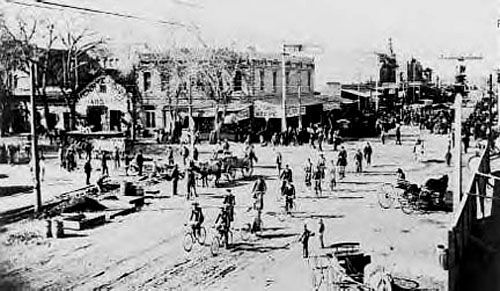 The town continued to grow quickly and within a year of Henry’s coming to Phoenix, there were 16 saloons and four dance halls, most of which were located on hell-raising Whiskey Row. Garfias set his mind to taming the lawless town, quickly responding to disturbances, which were common affairs, especially on Saturday nights. The only other “law” in the region, filled with rowdy cowboys and miners, was the military garrison stationed at Fort McDowell. More than 30 miles away, they could hardly help matters that often arose quickly and became lethal within minutes. The Latino lawman’s reputation began to spread, as one after another, he curtailed the many disturbances. When Phoenix was officially incorporated into a town in 1881, Garfias was appointed as the town marshal. Later, when a formal municipal election was held he won hands down, becoming the highest elected Mexican American official in the Valley during the 19th century. For the next five years he would serve as the city’s first marshal, continue to subdue the rowdies of Phoenix. Another tale reports that when he went to arrest an outlaw named Oviedo, who was better known as the “Saber Slasher,” Garfias was most definitely not looking forward to the arrest, as the men were personal enemies and Oviedo had threatened to kill Garfias on sight. However, he followed through with the warrant and went after the desperado. When he found him, Garfias fearlessly walked toward the dangerous man. Oviedo wasted no time grabbing his shotgun and firing point blank at the marshal. Again, one of the bad men had underestimated Garfias. By the time that the buckshot from Ovido’s shotgun harmlessly whistled over the marshal’s head, Oviedo had two fatal bullets in his body. On another occasion, several Texas cowboys rode into Phoenix, quickly displaying their habit of shooting up the town. Obviously, they were not familiar with Marshal Garfias. 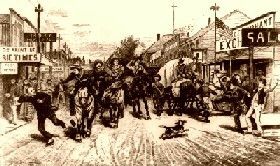 The minute Henry heard the shots, he was headed towards them, watching as the cowboys headed down Washington street, occasionally taking shots at doors, signs, and hanging lamps. Demanding they drop their guns and immediately surrender, the cowpunchers paid no heed and opened fire. When the smoke cleared, Garfias was unharmed, but one cowboy was wounded, and one of them was dead. He then rounded up the others and deposited them in the town jail. Yet another story tells of a time that the marshal was confronted by four rowdy cowboys who began to take shots at him from horseback, while Garfias was on foot. This time too, Garfias prevailed, leaving all four of them laying dead in the dusty street. In the meantime, Henry got married to Elena Redondo on April 13, 1883 and the two would eventually have a daughter and a son. He also had a number of other interests in addition to his lawman duties, which paid him $100 a month and a $3 bonus for every conviction he obtained. The marshal also ran a successful cattle ranch in Castle Springs, and established Spanish newspaper called El Progreso, with his brother-in law. For 22 years, Garfias would continue to serve in an official capacity, holding not only the position of town marshal, but later as an assessor, tax collector, constable, pound master, and street superintendent. Ironically, Henry would not die in one of his many dangerous confrontations, but rather from a fall from a horse. On May 2, 1896, while he was riding one of his favorite horses, the animal spooked and threw him off then rolling on him. 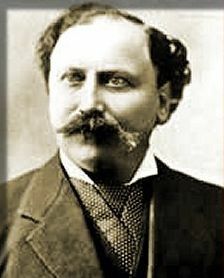 Though Garfias initially survived the fall, he was also suffering from tuberculosis and pains from several old wounds. Seven days later he died on May 8. “Painting The Town Red” – A wood engraving by R.F. Zogbaum, in Harper’s Weekly, October 16, 1886. During his lifetime, Garifas was arguably one of the most honest lawmen and sharpest gunfighters in the American West, on par with more famous names such as Wyatt and Virgil Earp, and Wild Bill Hickok. His deeds were the stuff that legends are made of, but for whatever reasons, his contributions have, sadly, been mostly ignored in history. Another Latino would not lead Phoenix’s police authority for nearly a century, until Ruben B. Ortega was appointed police chief on February 25, 1980. © Kathy Weiser/Legends of America, updated September, 2017..
Arizona: The Youngest State, James Harvey McClintock 1913.